Sometimes I like to break the rules, to see exactly how far I can go before there are consequences. I’m not proud of it, it’s just part of who I am. While I’m doing it, there’s a little voice in my head telling me that I’m just asking for trouble. But I can’t help myself. I’d like to think that I don’t do it as often as I used to. Being young and stupid only works as an excuse for so long. Eventually, you’ve got to ante up and pay the bill. So now I try and be a little more selective about my rebellious moments. Still, if someone says I HAVE to do ‘X’, it makes me WANT to do ‘Y’. See, I told you it’s not pretty. But sometimes breaking the rules is the only thing to do. If I had followed the exact instructions of the Three Cheese Drop Biscuits recipe in Bon Appetit – Fast, Easy, Fresh, I imagine we’d be having a much different conversation today. But I took one look at “rub butter in with fingertips until it resembles coarse meal” and said “hells no”. I remember what happened in Home Economics class when I tried to “cut” butter into flour. It was a big freaking mess. Bon Appetit isn’t going to talk me into going down that road again. I don’t care how Fast, Easy, or Fresh they say the recipe is. So I did what any rebel would do. I thumbed my nose at the recipe and pulled out the food processor. I was going to use it to grate the cheese anyway so why shouldn’t I also use it to work the butter into the flour? Yes, I know, the method by which one incorporates the butter and flour makes all the difference…blah, blah, blah. I hear ya, really. And I just don’t care. I’m going to do it my way. In fact, I’ll put my food processor drop biscuit up against one made to Bon Appetit’s specs any day. That’s how good I think these turned out. In fact, we scarfed the first batch down so quickly that I had to make a second batch the next day. There are few things that I’m willing to make two days in a row. Right now, this is at the top of that list. And the only trouble I think I can get into by breaking the rules with these biscuits is an extra pound or two that I’ll have to work off. 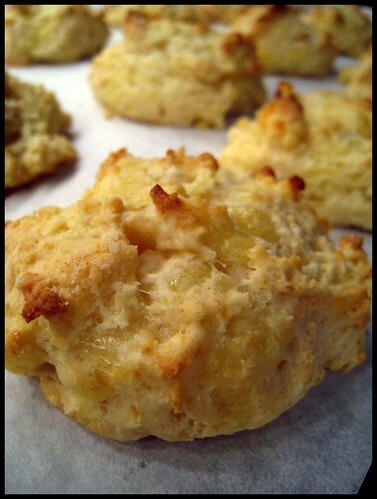 What can I say, Cheesy Drop Biscuits are worth an extra thirty minutes on the treadmill. BAH Tip: Softer cheeses, like Fontina, are easier to grate if you let them sit in the freeze for 15 to 20 minutes. Once they firm up, run it over your box grater or use the grating blade on your food processor for easy shredded cheese. Heat oven to 400 degrees. Lightly butter or line a baking sheet with parchment. Put flour, sugar, baking powder, baking soda, and salt in the food processor and pulse to combine. Add cubed butter and pulse until combined into a coarse meal. Add grated cheese and pulse once or twice more. Transfer mixture to a bowl, gradually add buttermilk, and mix to combine. Drop generous spoon fulls of dough (approximately 1/4 cup) onto the baking sheet, yielding 12 biscuits. Bake for approximately 16 minutes, until starting to brown on top. Serve warm, cold, or at room temperature. I am a fellow rule breaker, especially when it comes to cutting butter into flour. My one attempt at doing it by hand resulted in my husband coming to the table and asking “Why are we having saltines for breakfast?” I use my Kitchen Aid for this process now and it has never failed me. One question. Is it to mavericky to add bacon to this recipe? Kathy, I love how well the food processor cuts in butter. Just make sure it’s good and cold (the butter). Adding bacon is never a bad thing. I’d just make sure it is crumbled pretty well and cooled completely before adding it to the dough. Enjoy your mavrick bacon drop biscuits. I say tis better to ask for forgiveness than request permission. And now I want a biscuit with my lunch. Brooke, last night I had an utter biscuit fail with a different recipe. So now I’ve got unfulfilled biscuit desire. Am going to give it another try later today. Mmmmm, cheesy biscuits! You rebel, you. Rebellion has never tasted so good. If my Bread Bible biscuits fail me yet again later today, I may just have to give in and make a batch of these lovelies. Wendi–do you have a pastry blender? I find it’s the best way to cut butter into flour. In fact, I would use it to make biscuits now if I had any feeling in my arms. shoveling the street hurts. I have tried using a pastry blender but something about it just doesn’t work for me. I’m much happier dumping everything into the food processor and hitting the pulse button a few times. Fix yourself a nice hot toddy and relax from a long day’s shovel. I really hope we don’t get the anticipated 6 to 10 inches they’re calling for tomorrow…I may never get out of my neighborhood. Beth, please tell me that you’re not serious about 10 to 20 more inches. But I suppose that you wouldn’t joke about that given that you’ve spent all day digging out. Texas werather……..I am having a period of “snow envy” watching the weather Channel for the East coast! How ever did you know I was craving cheese biscuits? I think beng here in the Southwest, it will probably be Pepper Jack cheese tho. rules? We don’t need no stinkin’ rules! If everybody followed th estinkin rules we would all live in Europe and speak European ….or something! Emily, I love a big winter storm every so often but I am weary of the snow after this past weekend. And I’m dreading what’s to come in the next 48 hours. Can you send a little of that Texas winter our way? Pepper Jack cheese would work beautifully for these biscuits. And yes, that blender thing with the metal blades is a pastry cutter…which is completely useless in my hands. Just served these biscuits with homemade southwest chicken corn soup. Applause all round! Emily, I’m thrilled that the biscuits were a hit. I bet they tasted great with chicken corn soup. Were they super easy or what? Emily, I love your description. And it’s absolutely true that they are insanely easy. Hope they become a staple at your house.